Preserving the rich variety of life on earth is one of Toyota's priorities. We invest time and resources in conserving the planet's bountiful and beautiful flora and fauna. From small-scale local projects covering a few hectares, to more extensive collaborations that have a global significance and are helping to preserve and even improve the planet's ecosystem. Industrial site becomes thriving nature reserve! We have taken a lead in the UK motor industry by establishing a partnership with the Royal Botanic Gardens, Kew* to strengthen the ecological and environmental quality of our UK operations. This collaboration is transforming Toyota’s production sites and its national headquarters into thriving, sustainable habitats for plants and wildlife, supporting our global principle of working in harmony with the environment - Environmental Challenge #6. *Royal Botanic Gardens, Kew (UK) is a world famous scientific organisation, internationally respected for its outstanding collections as well as its scientific expertise in plant diversity, conservation and sustainable development in the UK and around the world. Toyota’s Burnaston car manufacturing plant in Derbyshire. Here, the aim was to demonstrate how a working industrial site can successfully support biodiversity through environmental land management. The project will secure a green legacy for the future, without compromising the cost or efficiency of its core business. A team from Kew was involved in the landscape planning and in providing expertise in horticulture, land restoration, seed quality, and project implementation with local landscape designers and contractors. The Derbyshire Wildlife Trust also collaborated in the project. Burnaston employees were encouraged to engage in the project, learn about the thinking behind the changes and get involved in the planting process. 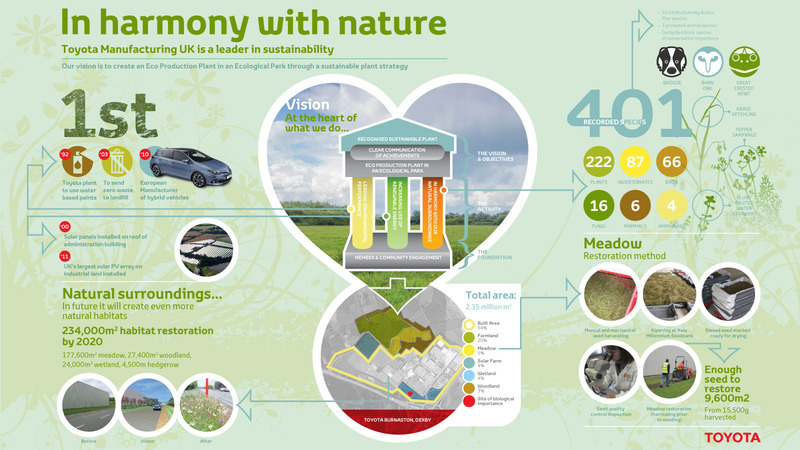 Increasing biodiversity at Toyota Manufacturing in Burnaston (UK). The 2.35 million square metre (580 acre) Burnaston site contains areas of meadow, grassland, wetlands, woods and hedgerows, and is home to more than 400 plant and animal species, some of them rare and protected. Working with Kew’s world-class experts in plant science, we have created even more natural habitats, with a plan to restore a further 230,000 square metres by 2020. Experts from Kew are helping biodiversity projects at Toyota’s sites in Belgium: our European headquarters in Brussels, technical centre in Zaventem and parts logistics centre in Diest. These and other projects clearly demonstrate that a manufacturer, working with an internationally renowned research and educational organisation, can create an ecologically rich environment that connects with its local surroundings and community, to ensure a future society in harmony with nature. Through the Millennium Seed Bank Partnership. This is a world-leading initiative to collect, dry and store high-quality seed collections of plants at risk of extinction. It’s led by the Royal Botanic Gardens, Kew, a world-famous scientific organisation that is internationally respected for its outstanding collection of living plants and its world-class herbarium. In addition, it has unrivalled scientific expertise in plant diversity, conservation and sustainable development in the UK and around the world. Seeds conserved in cold storage. The Toyota Environmental Activities Grant Programme is contributing towards the development of the Millennium Seed Bank Partnership. The grant funding enables new partners to be trained in Brazil and the rest of South America, and provides training courses for new global partners in the UK throughout 2016. It will also allow for new seed driers to be purchased; essential tools for the collection teams. We even have seeds taken from our TMUK manufacturing facility that have been placed in the seed bank! The project is critical to Kew’s ambition of collecting and conserving 25 per cent of the world’s wild plant species in their Millennium Seed Bank and their partner seed banks by 2020. In this way it will help to ensure that threatened plant species do not disappear forever from our planet. Kew scientist, Beverly Maynard, carefully places the seed jar for storage in the -20°C vault at the Millennium Seed Bank. Flowers of Arabica coffee (Coffea arabica), in Ethiopia. Discovering the wonder of nature. The Toyota Parts Centre Europe (TPCE) in Diest, Belgium is cooperating with its long-standing partner, the Flemish nature conservation organisation Natuurpunt, to transform parts of its site into a nature reserve. Els Leysen, Environmental Coordinator at TPCE, explains the project. Els Leysen, Environmental Coordinator at Toyota Parts Centre Europe, Diest (Belgium). “It started a few years ago when we constructed an insect hotel at TPCE. This is a wooden framework where insects can find refuge, lay their eggs and hibernate. The next step was to construct a pond. It’s been great to see it being used by dragonflies, frogs and salamanders. In the evening, bats swoop over the water, catching insects. How did the environment change? Insect hotels are helping to enhance the traditional industrial environment in Diest (Belgium). Insect hotels provide different nesting options for a variety of insects. Less mowing allows nature to flourish. Our Parts Logistics Centre in Diest is actively promoting biodiversity in collaboration with the local Natuurpunt organisation. “We are planning an insect garden around the insect hotel to attract and feed more bees and other insects. Creating this bee-friendly environmental is crucial, as bees are important pollinators that are essential for the food chain and biodiversity in general. Is that a yellowhammer I can hear singing? “Yes! The yellowhammer is a small farmland bird that is under threat from modern agriculture. It won TPCE’s internal elections to become the ‘cherished neighbour’. The yellowhammer can be heard singing around our parts logistics site in Diest (Belgium). Toyota has financially supported a WWF project in the local community of Tiszatarján in north-east Hungary. It involves a community-based wetland conservation project alongside the Tisza river. The goal is to contribute in conservation of the area’s natural floodplain wetlands, grasslands and key species. At the same time the project increased awareness of ecosystem management practices and helped diversify local income streams through bioenergy generation. Wetland conservation alongside the Tisza river. The Tisza river is one of the most important and most sensitive water arteries in Central Eastern Europe. The area used to be a beautiful mosaic of sparsely forested floodplain grasslands, wetlands and softwood forests. A large part of the area is nationally protected as a park, and internationally protected as a Ramsar* wetland site. Key species, some with a global significance, such as black stork, white-tailed eagle, saker falcon, Eurasian beaver and countless water birds migrate to the area in the spring. However, due to the rapid expansion of invasive plants such as Amorphy fructicosa, the original vegetation has been forced back along the river. The consequences are extremely damaging: a loss of biodiversity, reduced flooding capacity, and birds are prevented from nesting and animals from finding shelter. *Ramsar is the Convention on Wetlands, called the Ramsar Convention; an intergovernmental treaty that provides the framework for national action and international cooperation for the conservation and wise use of wetlands and their resources. Thanks to our partnership with WWF, these invasive plants have been eradicated to restore the floodplain to its former glory. Water buffalo have been reintroduced in wetland areas and Hungarian long-horned grey cattle in woody grassland areas to help restore the grasslands to their former species-rich splendour. Semi-managed grazing also attracts new biodiversity to the wetlands, such as water birds. Beavers have been reintroduced to diversify the wetland’s landscape and restructure floodplain habitats. Semi-managed grazing that attracts new biodiversity to the wetland. The combination of grazing and invasive plant eradication is an ideal conservation effort to create ecological corridors and improve biodiversity quality on wetlands and grasslands. These changes provide an attractive landscape for eco-tourism, which can bring in additional revenues to economically diversify and better sustain this rural community. With Toyota’s help it’s been possible to develop a community-based floodplain conservation project that could be expanded throughout the Carpathian region and in other regions where local communities rely heavily on floodplains. Helping people return to work. These workers are bundling invasive plants that are then used as an energy source. Toyota Motor Corporation annually selects a number of projects that are funded through the Toyota Environmental Activities Grant Programme. This programme was launched in 2000 to celebrate Toyota’s receipt of the Global 500 Award from the United Nations Environment Programme the previous year. Sorry? Did I hear that correctly? “Sardines ... more important than cars!” This is what Didier Leroy, TMC Executive Vice President, said in a speech to mark our partnership with the International Union for Conservation of Nature (IUCN). Can it be true? What did he mean? To save threatened species from extinction, it’s crucial to know which ones are in danger before actions can be planned. This is the thinking behind the Red List of threatened species created by the IUCN. So far, IUCN has assessed around 80,000 species. Its goal is to double this number by 2020. As many as 23,000 species have been found to be threatened with extinction. Toyota has signed a five-year partnership with IUCN to provide funding to help IUCN achieve its goals. Toyota’s grant will enhance the Red List’s invaluable role in helping determine conservation policies; tracking progress toward reducing biodiversity loss providing data for scientific research and raising public awareness about species. The funding will increase knowledge on the extinction risk of more than 28,000 species, including many that are key food sources for a significant portion of the global population. Left to right - Inger Andersen, IUCN Director General, Didier Leroy, TMC Executive Vice President and Dr Jane Smart, OBE, Global Director, IUCN. So it also concerns our food supply? Absolutely. IUCN experts have chosen to focus much of the newly funded research on the populations of plants and fish that billions of people depend on as a vital source of food. These include species of wild rice and wheat that are crucial to food security. Additionally, marine fish, such as sardines, pilchards, sole and plaice will be assessed. They are not just a source of food for billions of people, but catching and processing them provides work for an estimated million people worldwide. There are many reasons for us to support the IUCN. Here, we highlight the two most important ones. Firstly, since Toyota’s foundation, we have addressed environmental issues as a key challenge with the idea that our company’s actions should contribute to the development of a sustainable society. We want to create a net positive impact, meaning we want to create value for society that goes beyond just focussing on clean mobility. Secondly, the way IUCN works by gathering data allows coordinated action. This is at the core of Toyota’s thinking too. We are a very fact-based, data-driven company. We even have a Japanese word for checking the facts: genchi genbutsu. Without this data that IUCN collects, it would be impossible for other NGOs, governments and society to protect and restore biodiversity.